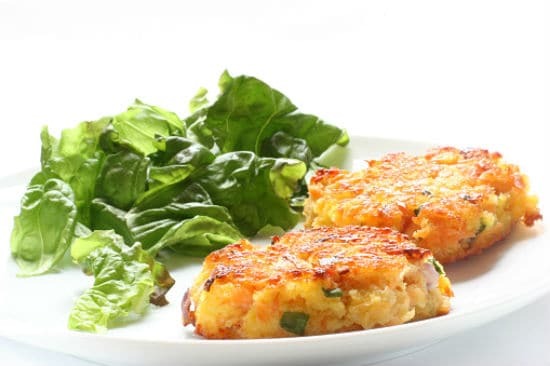 A delicious appetizer or starter, these crab cakes are a popular crowd pleaser. Simple and easy to make, they are perfect for a lunch, dinner or party. 1. To make the creamed corn, boil the sweetcorns until tender and drain well. 3. Add the flour and stir well. 4. Add milk and whisk well. 6. Add the sugar, sweet corn kernels and mix well. 7. Simmer for a minute more and remove from flame. Keep aside until required. 8. Combine the crab meat, potatoes, carrots, spring onions, creamed corn, egg, lime juice, maida and coriander leaves in a large bowl. 10. Make small balls of the mixture and flatten them into patties. 11. Heat oil in a nonstick frying pan. 12. Cook the crab cakes for 2 to 3 minutes on each side or until golden brown. 14. Serve with sweet chilli sauce and lime wedges. Feel free to comment or share your thoughts on this Sweet Chilli Crab Cakes Recipe from Awesome Cuisine.